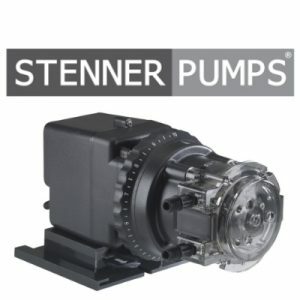 Midland Implement is a proud distributor of Stenner Pumps. Founded in 1957, Stenner is the market-leader in metering pumps. Stenner peristaltic pumps are used in water treatment, cooling towers, car washes and pools. What is a peristaltic pump? A peristaltic pump is a self-priming pump that achieves pumping action by moving a system of rollers against a flexible tube. The pumped fluids (e.g., chemical feeds) are never exposed to the air or to the mechanical moving parts. The roller design prevents siphoning by providing a constant seal on the pumping tube. The time-tested Stenner design is known for exceptional reliability and ease of service. Reliable performance means a dependable pump and a dependable pump reduces service time and expense. In addition, Stenner quality workmanship produces pumps that are durable and accurate to 2% at all settings.